In this article we examine solubilizers, how to use them and review the performance of a selection of “natural” solubilizers. We are frequently asked how solubilizers differ from emulsifiers. Solubilizers and high HLB emulsifiers are both surfactants which help disperse oils in water. Solubilizers are more water soluble than emulsifiers and are used to incorporate very low level (usually less than 2% total lipids) into an aqueous formula such as a shampoo, shower gel, toner to obtain a transparent formula. The aim is usually for the formula to be clear, unlike an emulsion (with emulsifiers) which contains substantially more oils and is usually white. If the particle size of the dispersed (oil) phase is <100 nm, the dispersion normally appears clear. 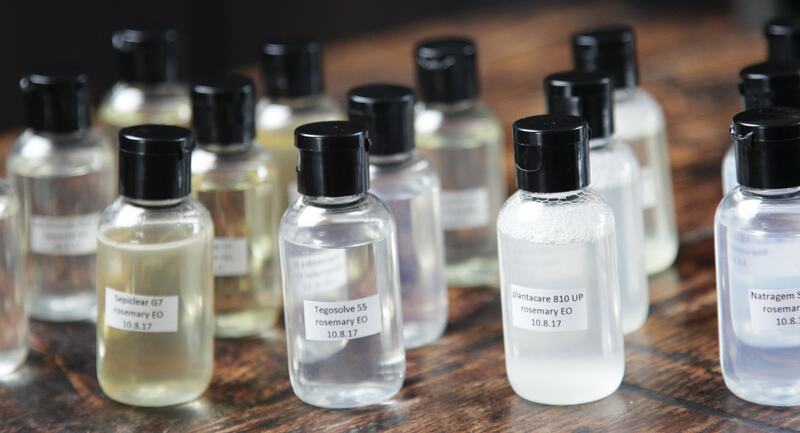 Typically these dispersions are used to solubilize fragrance oils into water based products and have a particle size of ~5nm. How to use a solubilizer. The solubilizer is mixed directly with the oils and this is then added to the water. Generally speaking, the amount of solubilizer required will depend on the polarity of the oils to be solubilized. The more polar the oils, the less solubilizer is needed. Formulators using synthetic solubilizers usually start with three parts solubilizer to one part oil. For “natural” solubilizers it is recommended to start with six parts solubilizer to one part oil. If the product remains cloudy or oil is floating on the surface, more solubilizer should be added. The key historic benchmark solubilizer is PEG 40 hydrogenated castor oil. Many formulators also use polysorbate 20 and polysorbate 80. These solubilizers are synthetic and in our discussion group we are often asked to recommend “natural” solubilizers. We tested five “natural” solubilizers with patchouli, rosemary and lavender essential oils at varying concentrations. We also examined the price of the solubilizers as this is an important consideration for most formulators. When comparing this, at the time of testing (10 August 2017), Symbiosolv clear plus was approximately 3.5 times the price of Natragem S140. The other solubilizers (Sepiclear G7, Tegosolve 55, Plantacare 810 UP) were also priced significantly less than Symbiosolv clear plus, however, Natragem proved the most cost effective. Symbiosolv clear plus is sold here and Natragem S140NP is sold here. For a general list of worldwide ingredient suppliers click here. For Europe click here and for the USA click here. 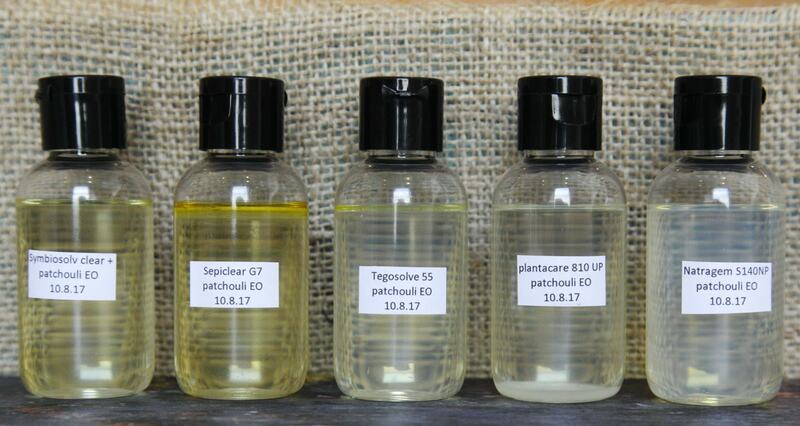 In our tests, patchouli essential oil was the most challenging to solubilize and the photo below shows six parts solubilizer to one part patchouli. The overall winners are Tegosolve 55 and Natragem S140NP which both performed consistently well with the different essential oils and concentrations tested.